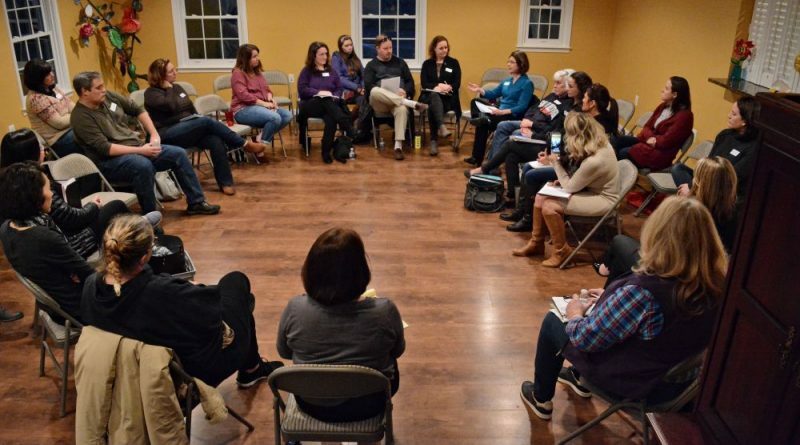 Almost two dozen parents of children with special needs gathered at the ALLY Advocacy Center at Paxton Campus in Leesburg on Monday night to share stories of isolation and alleged retaliation at the hands of school staff—and to plan their next steps. They told stories of visiting schools to find their children had been shut into tiny, sparsely furnished spaces all alone for hours at a time; and of children traumatized and set back in their learning by the experience. Some parents said when they complained about the treatment, they were reported to Child Protective Services. Alex Erkiletian, a father of a child with Asperger Syndrome, said he discovered his son had been shut into a small “chill room” or “cool-down room” at Frederick Douglass Elementary School for hours at a time. He later saw that room. Jennifer Vernon, who has a son at Stone Hill Middle School, said her son has seen the inside of a chill room, too. She said he struggles with Attention Deficit Hyperactivity Disorder and anxiety. 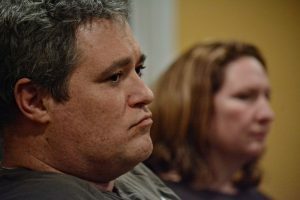 Erkiletian has since pulled his son out of Loudoun County Public Schools. He said he believes principals and teachers “had very good intentions” but were not given the right resources by school administration. His son now loves learning, he said. Erkiletian met with school administrators last February about his son and recorded the conversation. He said Loudoun County Public Schools Behavior Specialist Alison Lyons, his son’s former teacher, an assistant principal and a guidance counselor were in the meeting with him. In that meeting, he was told his son was put in that room because he was screaming and using vulgar language. Erkiletian asked school staff about how his son had been treated, and tried to get an answer to how often his son has been in the chill room. He was told records are not kept. Two months later, he said, he was reported to Child Protective Services as a negligent father. That investigation has been closed. Other parents said they have seen similar reports, which they believe to be retaliation for complaining. And as a professional photographer, Erkiletian gave much credit to a student with special needs at Belmont Ridge Middle School who took a photo that brought the practice of confining special needs students to the public eye. The photo, originally published in the Loudoun Times-Mirror, depicted a student walled off in a corner of a room with two staff working in another corner of the room. “A photo like that changes things,” Erkiletian said. The meeting was also attended by members of three organizations at Paxton Campus: Kendra McDonald, director of Clinical Services at the Aurora School; Jennifer Lassiter, former executive director of the ARC of Loudoun and now CEO of the Margaret Paxton Memorial Trust; and Eileen Shaffer, administrative director of the ALLY Advocacy Center. But parents say there is little documentation of what their kids go through during school hours at local public schools, and they have trouble getting that. The meeting was led by Claudia Skinner, a parent of a child with special needs who’s also trying to connect concerned parents to an attorney from Fairfax who specializes in special education and Assistant U.S. Attorney Steve Gordon, with the U.S. Attorney’s Office for the Eastern District of Virginia’ Civil Rights Coordinator. “I was just tired of having to fight this fight all the time, and then having the next parent fight the same fight,” Skinner said. Parents at the meeting said these are not new issues, but they are not always taken seriously by other parents when they complain, and are under a burden that makes it difficult to act. She was one of a handful of parents at a town hall meeting with Senator Jennifer T. Wexton (D-33) and Dels. David A. Reid (D-32) and John J. Bell (D-87) on Saturday. They raised those concerns to the state elected officials there. 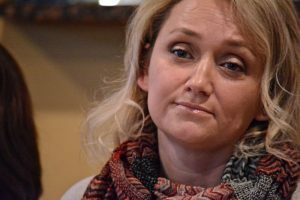 Bell said those officials would be jointly sending a letter to ask for an investigation into Loudoun County Public Schools’ practices, and ask the state Department of Education to get involved. “We can use our positions to help get as much information as we can, and frankly if anyone’s having a retaliation—that’s a criminal issue, we can get the authorities involved,” Bell said. According to that presentation, “seclusion is not a teaching procedure or behavioral intervention and should NOT be administered as punishment or to address behaviors for non-emergency reasons, such as noncompliance, disrespect, disobedience, misuse or destruction of property, disruption, threats, etc.” and “should last only as long as necessary to resolve the actual risk of danger or harm while awaiting the arrival of other trained staff.” Furthermore, after seclusion, the student must be seen by a health clinic staff member, the incident must be reported to the principal, and school staff must try to directly contact the parent of the student within a day of seclusion. Skinner said those parents from Monday’s meeting at ALLY Advocacy Center will gather again. “We’ll have a lot of things that will prevent us from coming back, but if we don’t take this and push for this, and try to do as much as we can as fast as we can, it’s going to die,” Skinner said. If your child is out of control they need to be somewhere besides a learning institution. Your child’s disability is not a blank check on the taxpayer dollar and they should cap the special education budget. If these parents think that the public school system should be able to handle this ion a normal classroom setting, they need to become educators, and try to see how it actually works with 25-30 other students in the room, that are not constantly disrupting / throwing things, hitting staff or other students (or biting)… The “chill” rooms are sparse for a reason – protection from and for the kids when they get into an out of control state. “I now homeschool him,” Erkiletian said. “I brought him up from third-grade level math up to his grade, fifth-grade level, since September.” – This is a very viable solution… None of the public school teachers / staff have or should have the specialized training and resources/staff needed to handle these situations. There is no fault… the public school system is not and should not be equipped to handle the kids that cannot control their own behavior to these extents. I guess the misunderstanding here of the readers that posted comments is that they do not know who this children are. The children in these stories are not out of control at all. They have a disability and they are using techniques that are used with mental health patients and prisoners to treat them. The point of this article is that the system is broken and as a result children are being abused by the very people that are entrusted with their education. Most of this parents had no idea this was going on! If a child was treated this way in their home, they would be taken away by social services and the parents would be charged with abuse. Again the system is broken, it is about children’s needs not being met.